BANANA CANNON WILDS - he splats a box of bananas on the middle of reel 3 which spread out and cover various potions, usually 5 or more, with Wilds. The reels then spin to form wins and are usually good wins too. GOLDEN BARREL SUPER SPIN - similar to the above, but the golden barrels transform into another symbol of the same type for an award if your luck's in. Not as preferable as the Banana Wilds though. BONUS BOOST - 20-40 extra scatters are added to reels which then spin for a significantly higher chance of triggering the free games/bonus features by landing 3 or more. Not guaranteed to come in, but you will always get the 2 land and then the 'heartstopper' spin for the third. KING KONG SPIN STREAK - he will start smashing the reels with a mallet after a win lands. This will hold the winning symbols and the reels will respin until no more winning combinations of that symbol are added. KONG RESPIN - after any of the above features, Kong may randomly offer a respin/repeat! So say you have the Banana Wilds and are paid, the Wilds may hold and another spin takes place for another decent win! BARREL BLAST BONUS - After a short transition, a scene will be shown with a number of Barrels on screen along with a win plan to the left. The player selects barrels to reveal an item. Each item will match up to a total bet multiplier, which is paid for matching 3 of the same item. Additionally, revealing a special icon will upgrade the total bet multipliers, and collecting 3 Golden Monkeys shall award the King Kong Cash Big Monkey Bonus. KING KONG TRAIL BONUS - You will be presented with a secondary platform bonus screen in 2 stages. 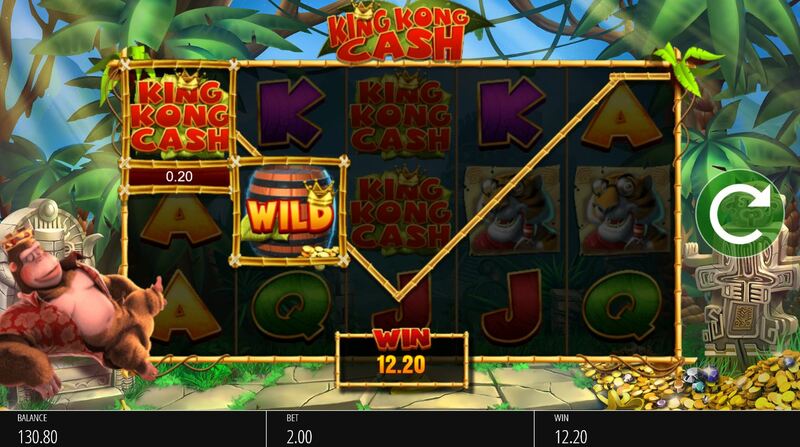 Stage 1 is a multiplier trail up the levels to the King Kong Cash Big Monkey Bonus stage 2. You need a Golden Monkey to go straight there, otherwise you get multipliers of stake or get terminated by a bomb. This will pay 1000x stake if you get to the very end of stage 2! EMPIRE FREE SPINS - you will go to the top of the Empire State Building with multiple reels in view. The screen will start at the top, before the screen pans down the other reel sets, which display the reels, and a side banner detailing the upgrade for that reel set. You start with the bottom level. The object of the Free Spins round is to collect Golden Monkeys which appear randomly on the reel symbols. By collecting a number of Golden Monkeys this then advances you up to the next reel set. The further you level up, the more powerful the upgrade awarded. 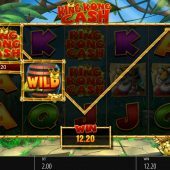 GOLDEN KONG FREE SPINS - Golden Kong Free Spins are played out on a 5x4 reel format with 40 win lines and 10 Free Spins. You accumulate any Wilds and afterwards get 1 or more Wild Spins. The accumulated Wilds are thrown onto the reels which will then spin. After this spin ends you choose 1 of 3 barrels over the top of the reels revealing either a Golden Donkey (Spins the reels again with the wilds shuffled to new positions) or a Bomb which ends the feature. There's no retigger but during Wild Spins, additional wild spin(s) may be awarded.